I was brought up with wholemeal pastry and I love the flavour and texture of it, but I used to find it really difficult to work with so rarely made it. Then I discovered the miracle of yoghurt. If you use yoghurt as the binding agent instead of water, it makes for a pliable dough that is easy to work with and has the added benefit of producing an even more delicoius pastry. I use stoneground wholemeal flour from our local National Trust mill at Cotehele and stock up on it whenever we visit. Traditional stone grinding keeps the grain from overheating and thus retains more of the nutrients. Most supermarkets stock stoneground flour these days, so it’s relatively easy to get hold of. Goose eggs are in season right now and I always try and get some if I can. Geese are generally only in lay for a few short weeks in the spring. The eggs have a large bright yellow yolk and a creamy flavour that makes them the most delicious of all the eggs I’ve tried. They also work very nicely in baking as you can see from my lavender chocolate goose egg cake and Willies cloud forest chocolate cake. These asparagoose tarts are my homage to much maligned yet useful birds. Having kept geese in the past, CT tells me that their bite is equal to their bark, or should I say honk? When those green spears thrust through the soil, spirits lift. Spring has arrived at last and the excitement of the asparagus season is palpable. I was hoping to get my hands on some Cornish asparagus, but the season is running a little late this year and our local greengrocers were still waiting for it to arrive. Luckily, they had English asparagus, so I was happy to use that instead. I wanted the asparagus tarts to have a surprise layer of pesto at the bottom, that wouldn’t be noticed until they were bitten into. As it happened, some of the green bits floated to the top, giving an attractive speckled look. Luckily, the pesto layer remained more or less intact. I used wild garlic pesto as I can’t seem to get enough of this at the moment, it’s another spring thing. but any pesto would work well. You don’t of course need goose eggs for this recipe, although its worth trying them at least once if you can find them. Three large hens eggs or four smaller ones will work almost as well. The quantity of pastry I used is enough for ten 10cm tarts with enough left over to make a few jam tarts. I made eight small ones and filled them with with my blackcurrant chill jam. It was beautifully sunny on Saturday. We planned to spend the day doing some much needed work down at the plot. But as it was a holiday weekend, we felt a picnic was in order. CT managed to cut the grass last weekend, so we had a nice green sward to sit on. These asparagus tarts were the star of the show. They were bright, cheerful and very tasty with the wild garlic pesto complimenting the creamy egg and the distinctive asparagus flavour very much in evidence. Some tomatoes, a bit of salad, a bottle each of apple juice with a couple of jam tarts to finish things off made for a perfect spring picnic. 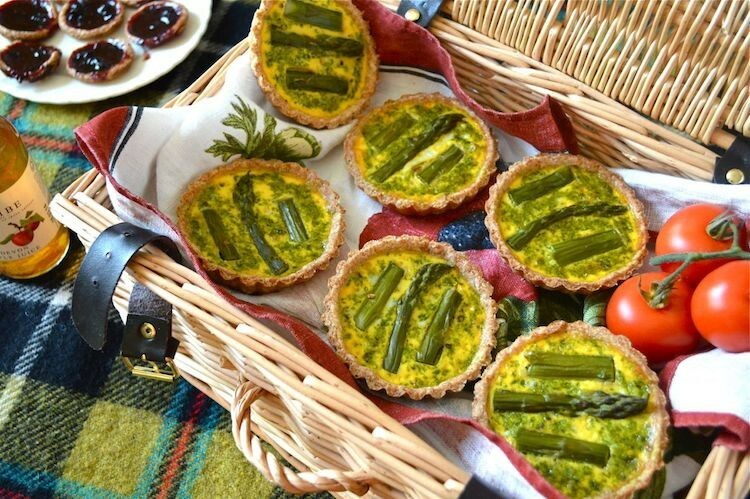 The asparagus season should be at its zenith during National Vegetarian Week, so that would be a perfect opportunity to make these asparagus tarts; gather the family, load up the hamper and head for the hills – or beach. National Vegetarian Week runs from the 16th to the 22nd of May this year. It’s a time to celebrate all things veggie, but particularly the stories and traditions behind the food we eat. There are lots of ways to get involved, including organising a picnic for friends, family or your local community. Do take a look at the National Vegetarian Week website for lots of ideas, recipes and posters and use the hashtag #nvw16 in any related social media posts. For even more vegetarian recipe ideas and information, head to the Vegetarian Society and Cranks websites. Nutty wholemeal pastry baked with a secret layer of pesto, filled with goose egg and topped with English asparagus. Ideal spring picnic fare. In a large bowl rub the butter into the flour and salt with your fingers until the mixture resembles breadcrumbs. Stir in the yoghurt with a flat bladed knife until the mixture starts to form into clumps. Start with 3 tbsp, then use more if needed. Cover and leave to rest in a cool place for ½ an hour or so. Roll the pastry out on a floured surface as thinly as possible and cut out circles big enough to fit the tart cases. Reroll the trimmings until all of the pastry is used. Press the pastry into the sides and trim the tops with a knife. Blanch the asparagus in a little simmering water for a couple of minutes. Drain the spears and cut theminto three pieces. Spread a ½ tsp of pesto on the bottom of each tart case. Place the asparagus pieces over the top. Whisk the egg (or eggs) in a jug with the milk and a little salt and pepper and divide the mixture between the tarts. Be careful not to overfill them as the mixture will rise during cooking. Bake at 200℃ for about 20 minutes or until the pastry looks golden and the filling has set. Leave to cool in the case then remove the tarts from the tins. You can use a food processor to make the pastry. There will be some pastry left over, enough for eight small jam tarts. The asparagus water makes lovely stock. The tarts can be kept in the fridge for up to three days. For even more tart recipe inspiration, head over to my Tasty Tarts and Pastry Pies Pinterest board. I’m sending these asparagoose tarts off to Meat Free Mondays over at Tinned Tomatoes. These also go off to Bake of the Week at Casa Costello and Maison Cupcake. Treat Petite with Baking Explorer and Cakeyboi is celebrating picnics this month, so my asparagus tarts fit right in. And as Tea Time Treats is celebrating anything colourful this month, my asparagoose tarts are heading off in that direction too at The Hedge Combers and Lavender and Lovage. And with asparagus very much in season, these go to Feeding Boys for Simple and in Season. Eating Al Fresco is a new monthly linky over at Munchies and Munckins. I’m sending my asparagus tarts in that direction too. Thanks for visiting Tin and Thyme. If you make these asparagus tarts, I’d love to hear about it in the comments below or via social media. Do share photos on social media too and use the hashtag #tinandthyme, so I can spot them. For more delicious and nutritious recipes, follow me on Twitter, Facebook, Instagram or Pinterest. I am excited to be working with Cranks who are sponsoring National Vegetarian Week this year. They have commissioned this post. Opinions are, as always, my own. Thanks to my readers for supporting the brands and organisations that help to keep Tin and Thyme blithe and blogging. Thanks very much Sammie, you do say some lovely things. If you can get hold of a goose egg or two, I’d really recommend it. They make fab scrambled egg too. Oh I love the idea of the surprise pesto layer! I love goose eggs too, family friends of ours when I was a kid used to have geese and ducks so we got to enjoy the eggs of both! Oh lucky you Kavey. I only got to try a goose egg 4 or 5 yrs ago. They are sadly, not easy to come by. These look so good and I’ve just made a large asparagus and wild garlic tart myself although I wish I’d had goose eggs!! Love the yoghurt in the pastry idea. I totally get that. Gorgeous. Yum – these look amazing! I love pesto and asparagus but I’ve never had a goose egg. I have used yoghurt and cottage cheese (‘kwark’ in Dutch) in dough before and you are absolutely right: it works perfectly. Goose eggs are wonderful in baking. I am happy to have a reliable source of really fresh ones in the next village. Thanks Vicky. Although it wasn’t what I intended, I ended up liking the speckled look too. Yes, everything is now gearing up towards National Vegetarian Week. These look divine… I love tarts for picnics… far more interesting than boring butties! Great tip about using yoghurt to bind wholemeal pastry too. Thanks Katie. II used to hate making pastry and now, although it’s not my favourite activity, I no longer avoid it – all thanks to yogurt. Oh these are SO cute Choclette, and the pesto surprise is such a fab idea. Definitely on my list for picnic season! Thanks Kate, the hidden pesto surprise wasn’t quite as hidden as I’d envisaged it, but in the end I liked the speckled look. Yoghurt? I am astonished, and must try this. The tarts look lovely, and are a reminder that we really could all benefit from fewer animal products in our diet. Thanks Helen. Maybe I should try kefir next time. Made with butter, yoghurt and eggs, these are pretty intensive on the animal product front, but I do balance this with eating a fair amount of vegan food too. Although I don’t eat eggs or dairy, I do have to admit that these look astonishingly good, and I love the name , ‘asparagoose’ – genius! BTW, I tried to click on the star rating but nothing happened – is it disabled? Hi Nicole. I have to admit that CT thought up the name. He is the wordsmith in our household. Thanks for trying to do a star rating. You have to click on the Write a Review under the stars – even though you don’t have to write a review – all very confusing! Thanks Aimee. I love spring and asparagus is always such a treat. Thanks Vohn. Asparagoose is CT’s genius, he loves a good pun. Yoghurt! Top tip, will definitely be trying that, thank you! Your tarts look divine! I love the way the pesto has floated up and speckled them, they look so pretty and perfect for a picnic! 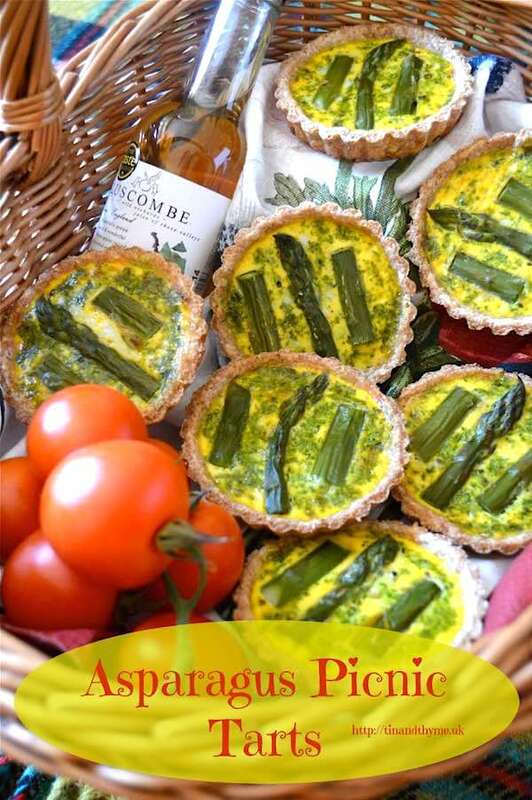 Thanks so much for linking to my polenta tartlets – I feel a spring picnic coming on! The sun is shining and picnics are calling. Yoghurt is a totally magic ingredient – love it. Thanks Kerry. I think if I didn’t have the pesto in there, feta would be a very nice addition. Oh these look amazing, love the colour. I am in love with asparagus right now and I bet it works so well in these tarts. I really want to try your pastry recipe too – will keep an eye out for stoneground flour. Thanks very much Sherri. I shall cross fingers for you that the weather improves very soon. It’s been sunny here today, which is just fabulous. I’ve never seen Goose Eggs for sale in our markets – but I’ll be on the lookout. These little tarts look like the perfect thing for Mother’s Day! Beautiful! Yes, you’re right Lisa, they absolutely would be and very seasonal too. This is must make recipe! It has 2 of my favorite things- asparagus and goose eggs. I haven’t had one in ages, since I was just a girl visiting my grandparents farm in the spring. They aren’t easy things to get hold of Sara, but how lovely to have tried them when you were young. These look outstandingly good. I have never cooked with goose eggs, in fact I have never come across them for sale but I will keep an eye out for them. You’re best bet are probably farmer’s markets Georgina or finding someone who keeps geese. They are well worth trying if you can find some. Thanks Helen. I love pastry and since discovering the yoghurt method, I make it more often. These look so tasty! My little girl loves asparagus but hates egg, I wonder if these would pass muster. Ooh they just might if you could get here on the spring colours – maybe? These tarts look absolutely gorgeous and such a great idea of an extra layer of pesto there. I really love your beautiful tarts. I really fancy making them! They look delicious with asparagus on top and I like the idea of using pesto too. A very good recipe! Just wonderful Choclette and I would add pesto too. Especially if it tasty homemade one like that. Thanks for submitting it to Meat Free Mondays. I did of course feature it. Fab photos! Stumbled, pinned and yummed. Oh and scheduled to a few Pinterest Boards. I will have to give yoghurt a try when making pastry! I love these tarts they are perfect for picnics, thanks for linking them up with Treat Petite! Thanks Kat, it’s revolutionised my pastry making. Oh hooray, another goose egg user Kate. I do sometimes wonder if I’m the only one. Has asparagus season not reached you yet? We’ve had English asparagus for a couple of weeks or so now. I’ve never tried goose eggs but these tarts are a lovely colour and look delicious! That layer of pesto must make them really tasty. I also prefer wholemeal pastry so I’ll have to try a bit of yoghurt in it next time. The yoghurt works wonders Corina. I used to hate making pastry, but now I don’t find it nearly such a chore. The goose eggs are amazingly yellow and the tarts were super tasty. Thank you. Thanks Sia. Yoghurt has revolutionised my pastry making. When I can manage it, I get my eggs from a small supplier where the chickens run around in the garden and get plenty of grass which gives beautifully bright yellow yolks.